Well-appointed even in base form, the 2012 Dodge Journey and its long list of standard features offers consumers some serious bang for their buck. To market the Journey as a value-based proposition, Dodge claims it the most affordable 7-passenger vehicle in America and includes a 5-year 100,000 mile powertrain warranty. If driving a minivan flags a big red check mark on your "no can do" list, but you need the kind of room and versatility a minivan provides, the 2012 Dodge Journey might be the answer. With a choice of 4- or 6-cylinder engines, and available AWD, the Journey can take you and your family safely, comfortably and perhaps most importantly, in style wherever you need to go. The 2012 Dodge Journey is nice vehicle, but it is not as modern or well-equipped as a Ford Explorer or GMC Acadia. Compared to a Honda Pilot or Toyota Highlander, the 2012 Dodge Journey does not hold its resale value nearly as well. The 2012 Dodge Journey SUV receives a revised trim line with five models: SE-AVP, SE, SXT, Crew and R/T. The new American Value Package (AVP) brings an entry-level price that makes the 2012 Dodge Journey SUV the most affordable 7-passenger midsize SUV in America. Later in the model year, the Crew and R/T will offer a rear-seat DVD entertainment package. If you're all about good design and a handsome, smart interior, we think you'll like what Dodge has done with the 2012 Journey SUV. Of the five trims, the SXT and Crew are the most flexible, with various interior color choices in rich fabrics or plush leather. Soft-touch surfaces and material cover just about any spot where you'd want to rest an arm or hand, and the properly sized 3-spoke steering wheel is fitted with redundant controls for the audio and cruise control. R/T and Crew models feature an advanced 8.4-inch touch-screen audio system featuring the Uconnect suite of communication and connectivity options. Highlights include voice-activated controls for the Bluetooth, navigation, audio and iPod, as well as "Eco-Route" guidance and song tagging. There's even a subscription option to Sirius Travel Link, which can provide updates for traffic, find the cheapest gasoline prices, plus report on sports scores, weather conditions and even movie times. On the versatility front, the 2012 Dodge Journey midsize SUV features a flush-folding third-row seat and second-row seats that can slide fore and aft (making access to the third-row seat a bit easier). Upper-level trims also have a flat-folding front seat that increases the cargo floor right up to the dashboard. 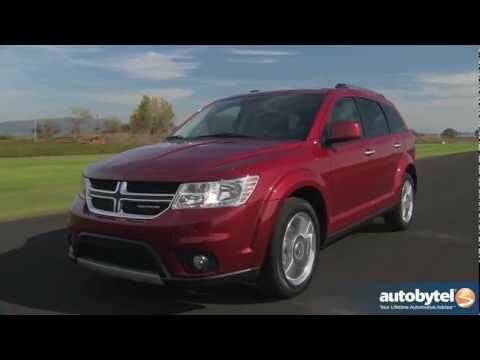 As midsize SUVs go, the 2012 Dodge Journey is on the larger side of the scale. Its tall stance and long profile give the Journey the look of a big wagon, similar to the old Chrysler Pacifica. The 2012 Dodge Journey SUV is so long, in fact, that it dwarfs the Toyota RAV4 and Ford Escape by nearly 10 inches. To keep the exterior from looking too family-wagonish, Dodge has dressed up the Journey with a chrome-trimmed cross-hair grille, flashy alloy wheel choices and, on V6 models, a more aggressive lower air intake. The R/T trim takes things up another notch with a monochromatic exterior, 19-inch wheels, and R/T badging. The 2012 Dodge Journey crossover might look like a tall SUV, but its ride and handling characteristics remind us more of driving the Dodge Avenger sedan. Careful attention to the 2012 Dodge Journey's suspension and steering calibrations give it a nice balance between agile cornering ability and comfortable, quiet ride. We were surprised how rapidly the Journey responded to steering inputs, and even when pushed hard into sharp turns the Journey exhibited only minor body roll and lean. With all three rows occupied, we discovered our front-seat and second-row passengers had nothing but praise for their accommodations. The third-row occupants, however, were not as kind. It was the general consensus that the Journey's third-row seat is best reserved for small children. The 2012 Dodge Journey's standard 2.4-liter 4-cylinder engine doesn't have to strain to move a lightly loaded Journey, but for overall performance and peace of mind, we'd recommend going with the Pentastar V6. The 3.6-liter Pentastar is one of the best V6 engines ever produced by Dodge, and may even rank as one of the best V6 engines of all time. From its abundant power to its excellent fuel economy, we found the 3.6 liter to be a real gem. The 2012 Dodge Journey AVP SUV has a Manufacturer's Suggested Retail Price (MSRP) starting just under $20,000. The SXT starts closer to $25,500, while a loaded AWD Crew tops out around $34,000. All-wheel drive (AWD) adds another $1,700 to the Dodge Journey's bottom line. Before you buy, be sure to check the Kelley Blue Book Fair Purchase Price to see what the Journey is typically selling for in your area. The 2012 Dodge Journey sport utility vehicle is expected to hold residual values comparable to the Ford Escape and Hyundai Santa Fe, remain slightly below the Chevrolet Equinox, and fall far below the 5-year values set by the Toyota RAV4 and Honda Pilot. A 2012 Dodge Journey AVP comes with a 2.4-liter 4-cylinder engine and 4-speed automatic transmission, power heated side mirrors, three 12-volt outlets, a 4.3-inch touch-screen AM/FM radio with a single-CD player, an audio input jack and USB port, keyless entry and push-button start, second-row in-floor storage, and a rear-cargo area covered storage bin. All models feature electronic traction and stability control, anti-lock brakes (ABS), front-seat side airbags, and 3-row side-curtain airbags. Beyond the base 2012 Dodge Journey AVP, there are four other Dodge Journey trims: SE, SXT, Crew and R/T. The SXT, Crew, and R/T have a 283-horsepower, 3.6-liter V6 engine and 6-speed automatic transmission. Options vary by trim and include all-wheel drive, UConnect Hands-free Communication network, leather seating surfaces, ParkView rearview camera, ParkSense parking assist, navigation, power moonroof, six premium speakers with subwoofer and 368-watt amplifier, third-row seating, rear-seat DVD entertainment system, 17- and 19-inch wheels, 3-zone automatic air conditioning, Tilt 'n Slide second-row seats, Flip 'n Stow compartment, and heated front seats. The 2012 Dodge Journey's front passenger-seat cushion flips forward to expose a big storage bin that can hide valuables from prying eyes, or just keep things in place. Behind the front seats are two bins in the floor that can accommodate up to a dozen 12-ounce cans and ice - or whatever else you can put in there. The bins have locking lids and are removable for easy cleaning. Engineered for commuting and good gasoline mileage, the 173-horsepower, 2.4-liter, 4-cylinder engine provides a sufficient amount of power for the weight of this crossover, but the potent 3.6-liter Pentastar V6, which pumps out 283 horsepower, is really the engine you'll want. Coupled to a 6-speed automatic transmission, the 3.6 liter never fails to deliver power when asked, and once up to speed, requires only minimal fuel to keep the Journey cruising. The Journey's V6 is also E85-compatible. The 2012 Dodge Journey SUV fits comfortably between a full-size and compact SUV, giving it the room to hold up to seven passengers in a package that is not unruly to drive or park. Fresh from a complete overhaul last year, the 2012 Dodge Journey SUV offers families a roomy and versatile environment with cabin styling and features more commonly found in high-end luxury cars. Crew models, for example, offer a choice of colorful leather seat trim, UConnect touch-screen radio with available Garmin navigation and keyless entry and start. But perhaps the best thing about the 2012 Dodge Journey is its available V6 engine, which is not only one of the most powerful engines in its class, but also one of the most fuel-efficient. Heated seats and you can connect to your Bluetooth throughout your speakers. Vehicle drives perfect it holds gas good if we are in pain we have the heated seats and we have 3 rows of seats in a vehicle and you have the Bluetooth to connect to your cell phone for iPods there is plenty of storage underneath your seats we have window wipers in the back to see out back by the window when it rains the windows in the second row are tinted and we get very good gas mileage on the highway and we have chrome rims the ac is perfect it keeps you cool and if you do not want to use the third row or the second row you can lay the seats down and have plenty of room for your groceries and if you are going on a road trip it is very comfortable and the stereo is very good too so overall I would recommend this vehicle to anybody. Dodge Journey. Dad mobile of the present. Vehicle is in top shape after 90000 miles. Continuing with average maintenance is a breeze and I have not had any worries regarding anything out of the ordinary. My Journey is completely comfortable for my family of six anywhere we go. It has a particular love for the German autobahn, although the manufacturers governor spoils some of the sport. I would recommend this car for the average dad as a sporty version of a soccer mom van. It continually gets the job done regardless of the situation. I have moved and lived in this vehicle in varying situations and still can not find a flaw with the creature comforts it provides consistently. 10 out of 10 would buy again. Great car for young families. We bought our Dodge Journey brand new. We needed a safe car for a two hour long commute with a preschooler. We also have two nephews who are involved in baseball and band. The car has a lot of hidden storage that is very helpful. The boys love the "way back" seats. The storage when the seats are folded down is very nice. I can fit our camp chairs in the back even when the seats are up; which is great when we are hauling multiple kids to ballgames. I love the conversation mirror above the rearview mirror which allows me to see everything in the back seat. The control panel is user friendly. Overall a great car.